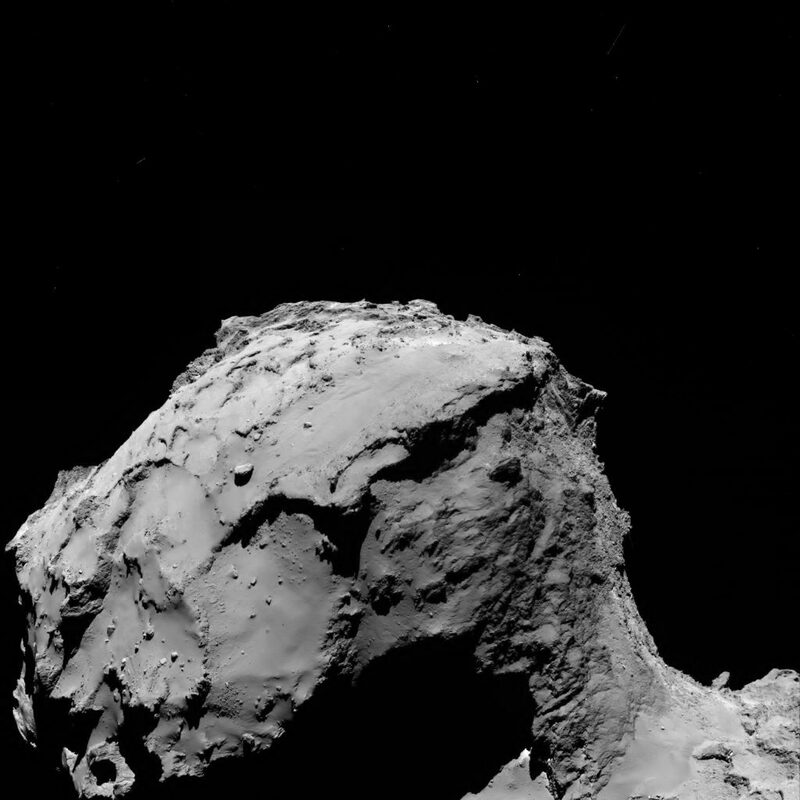 Based on the Navigation Camera images taken shortly after last night's collision manoeuvre, flight dynamics analysis has refined the predicted time of Rosetta's impact into the Ma'at region on the small lobe of Comet 67P/C-G to 10:38:32 UT+/- 2 minutes at the comet. 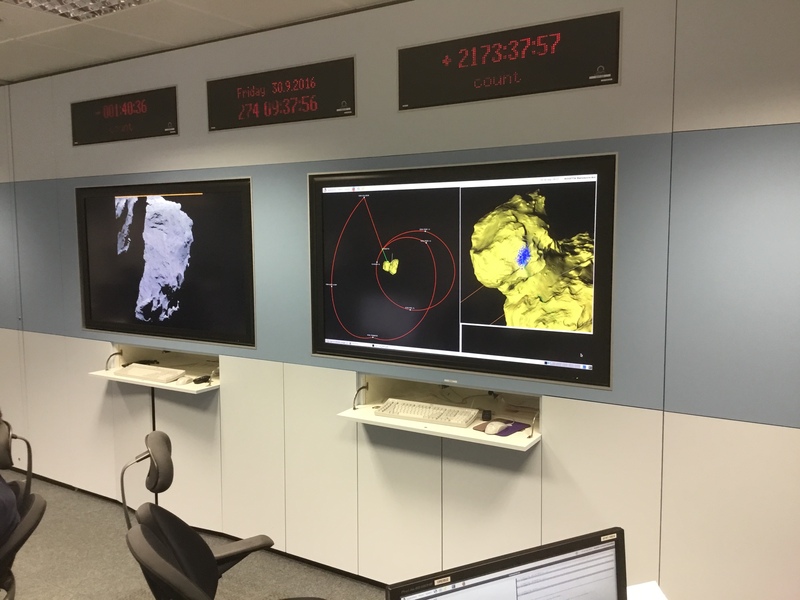 Because of the 40 minute signal travel time between Rosetta and the Earth today, confirmation of the mission's end will arrive at ESA's mission control at 11:18 UT/ 13:18 CEST +/- 2 minutes. 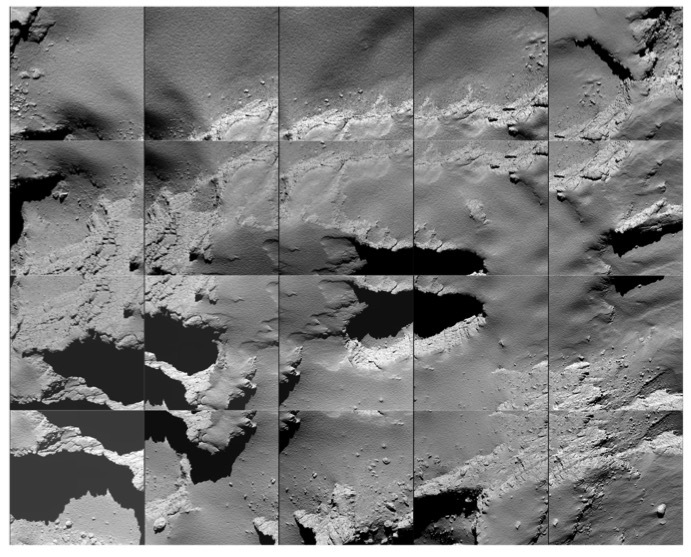 Rosetta's Navigation Camera captured five images shortly after the collision manoeuvre last night, which are being analysed by flight dynamics to confirm the spacecraft is on track to impact its target in the Ma'at region of Comet 67P/C-G later today. 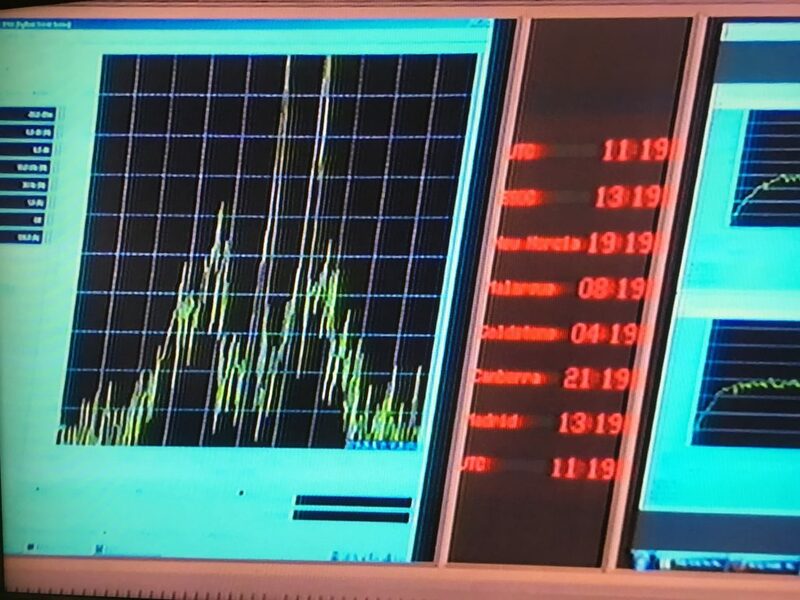 The last image returned from the spacecraft was taken at 00:59 UT onboard the spacecraft, and downlinked to Earth a couple of hours later. It was taken at a distance of 17.4 km from the centre of the comet. 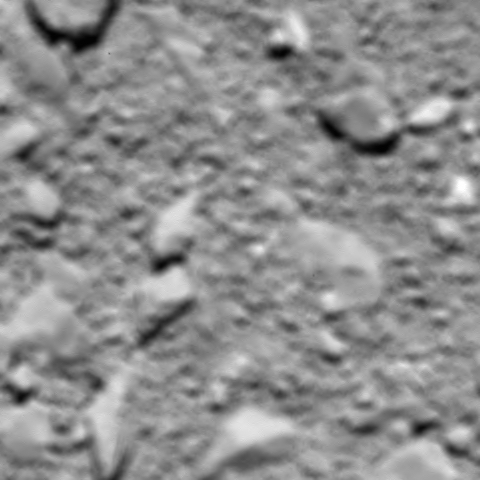 The image scale is 1.5m/pixel and the image measures about 1.5 km across. 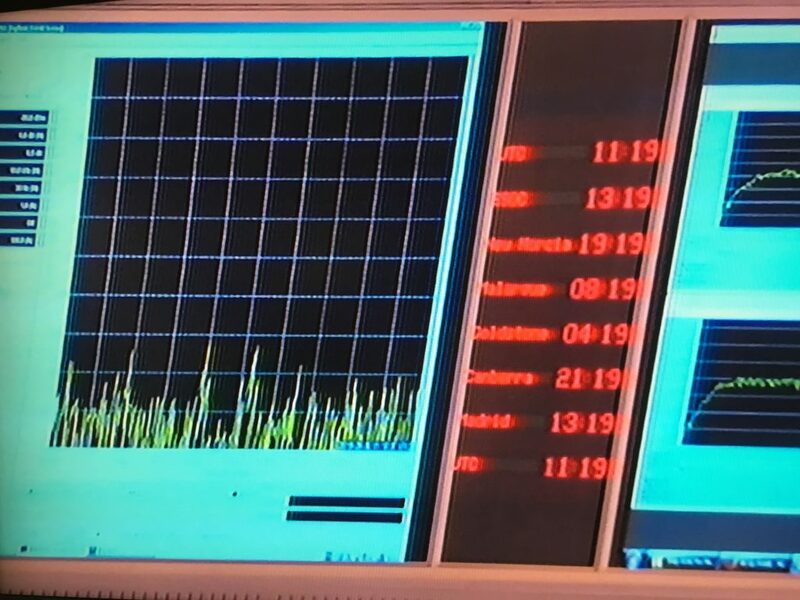 The five images were used by the flight team to update the estimate of the landing time and final pointing of the spacecraft. 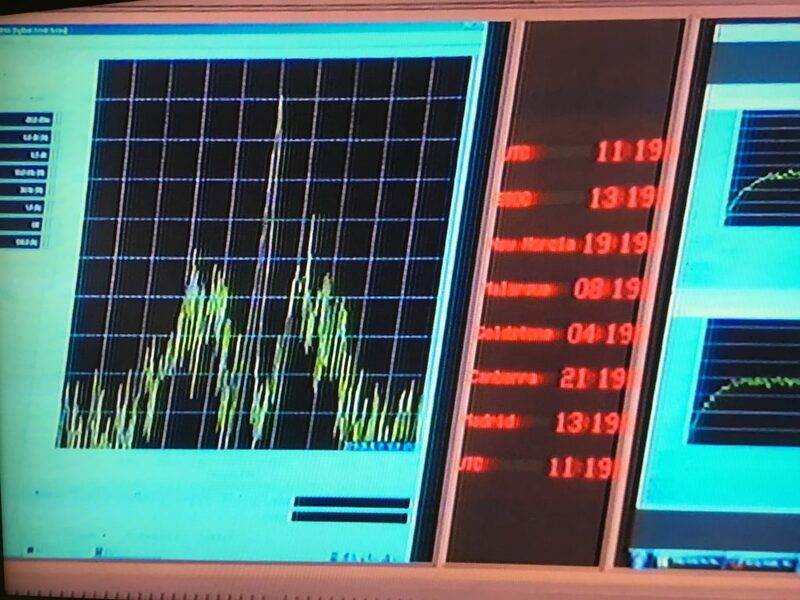 The revised impact time is now predicted as 10:38:32 UT+/- 2 minutes at the comet.Because of the 40 minute signal travel time between Rosetta and the Earth today, confirmation of the mission's end will arrive at ESA's mission control at 11:18 UT/ 13:18 CEST +/- 2 minutes. The full set of five images will be published later this morning. 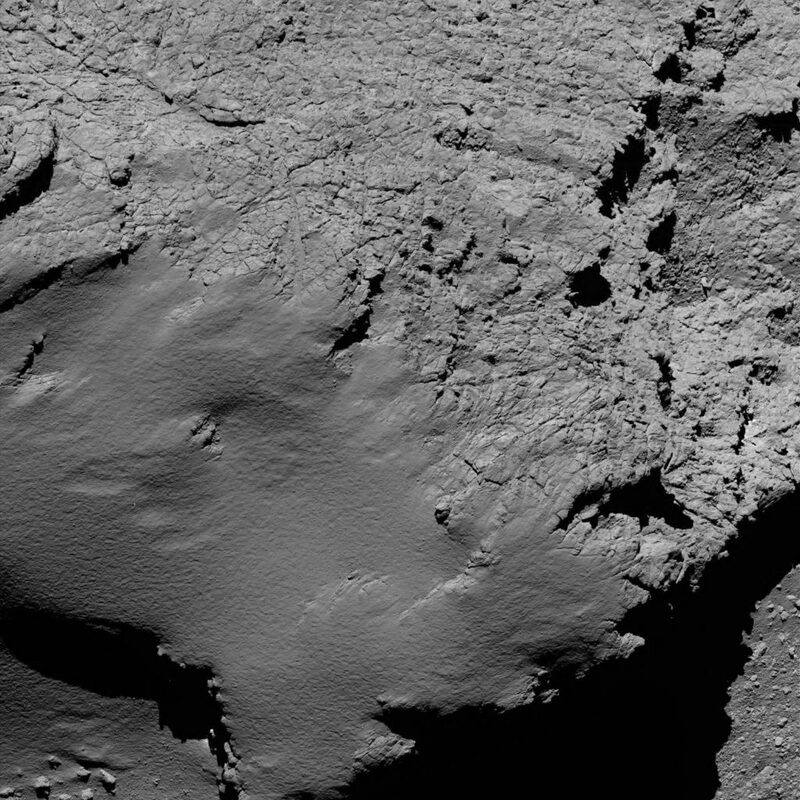 Follow rosetta.esa.int for live coverage. 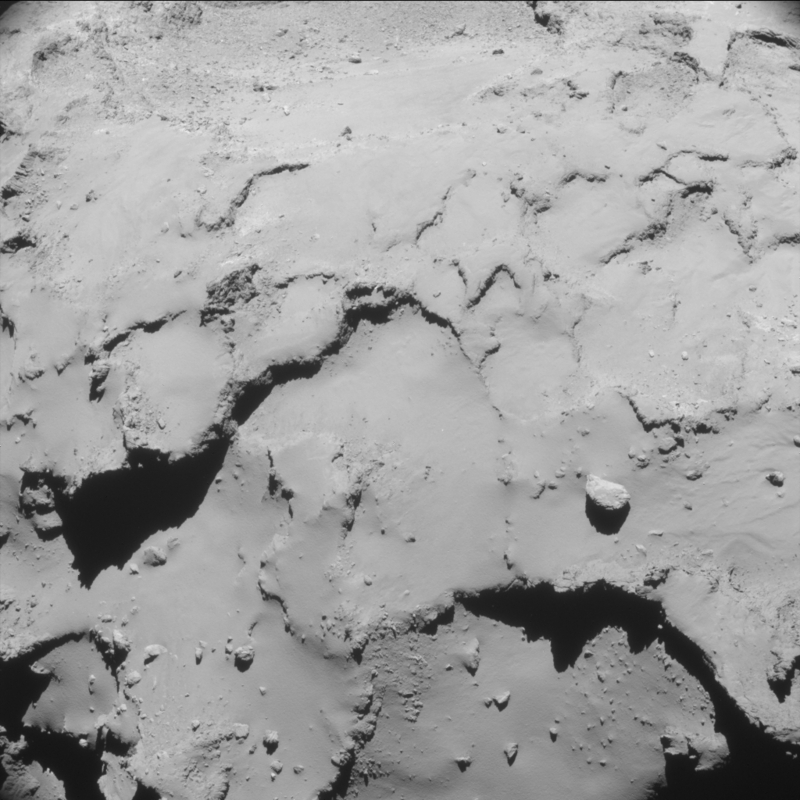 During Rosetta's final descent, which is currently undergoing, the OSIRIS narrow-angle camera captured this image of Comet 67P/Churyumov-Gerasimenko at 05:25 GMT from an altitude of about 11.7 km. 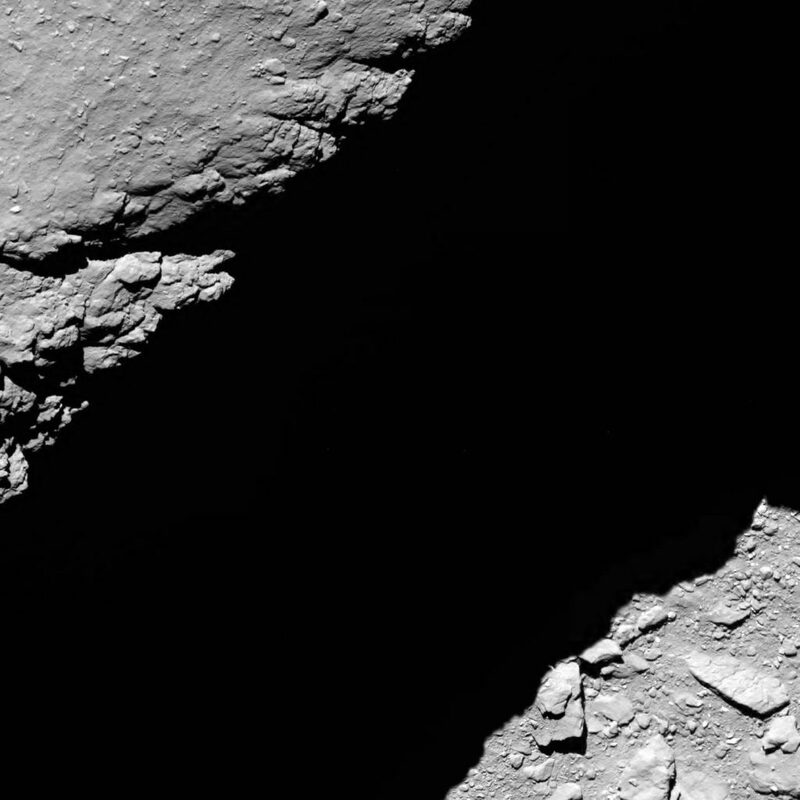 With dramatic shadows, the image shows the comet's 'neck' region, with the smooth terrains of Hapi on the right and the rougher Hathor on the left. 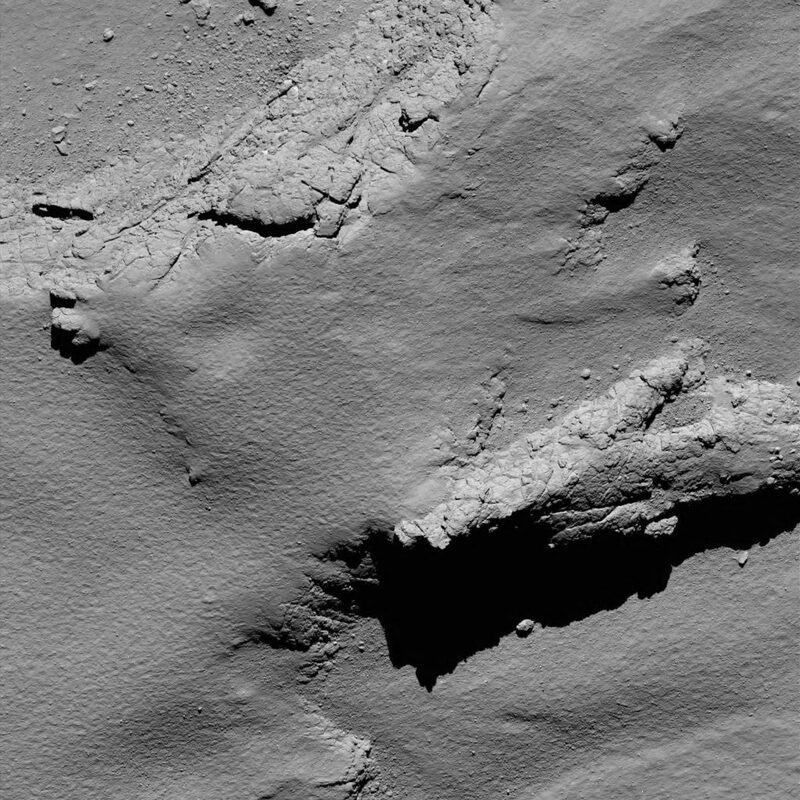 The image scale is about 22 cm/pixel and the image measures about 450 m across. 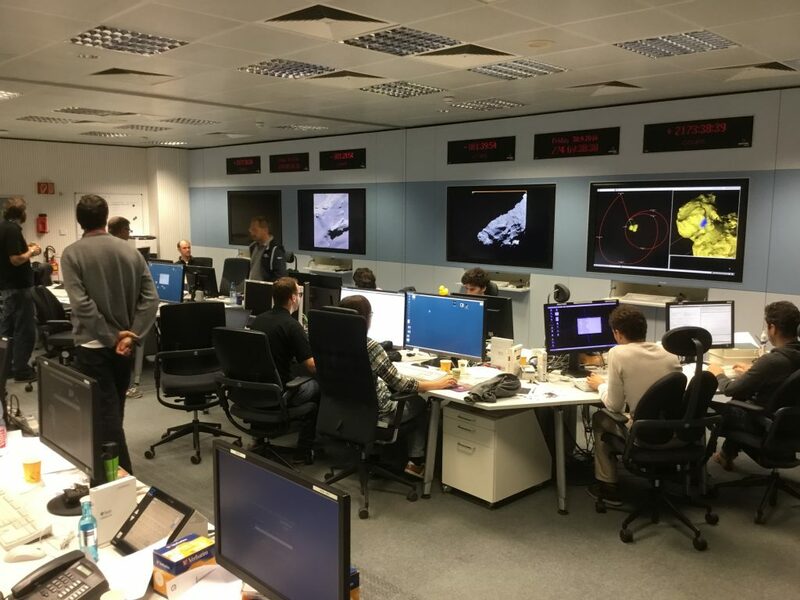 Throughout the entire Rosetta mission, the Flight Dynamics team at ESOC have been some of the hardest-working, behind-the-scenes wizards ensuring navigation – and today is no exception. 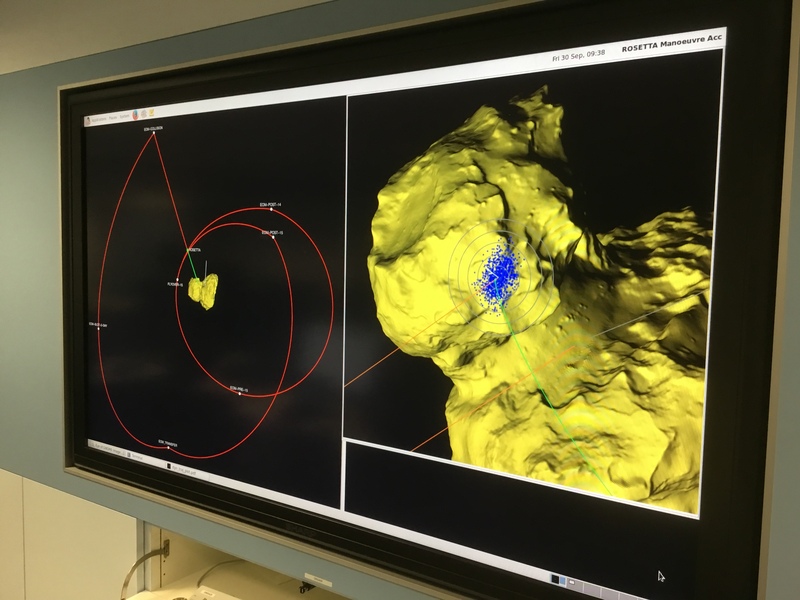 They also have some of the coolest visualization tools in the Solar System! 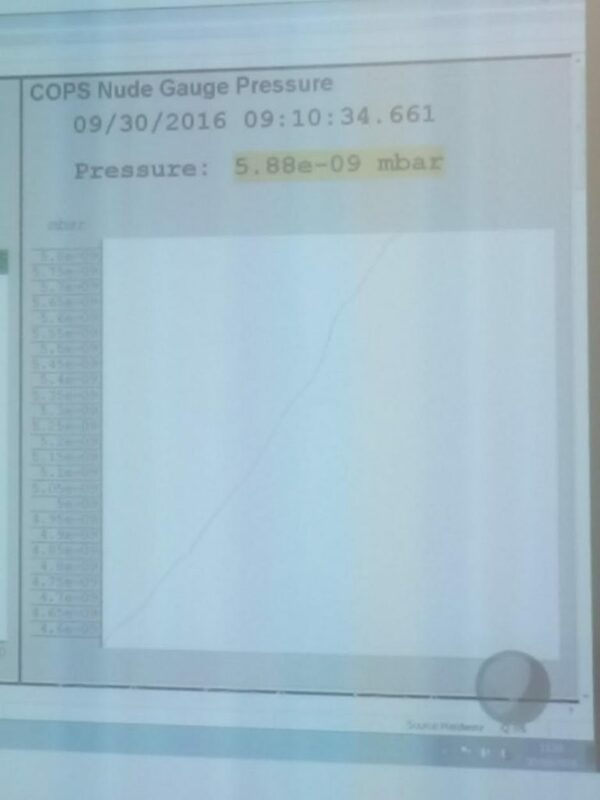 As Rosetta approaches the surface of Comet 67P/Churyumov-Gerasimenko, the Comet Pressure Sensor (COPS) on the ROSINA instrument is measuring the gas pressure around the nucleus increasing! The ROSINA-COPS readings on 30 September 2016. Image courtesy K. Altwegg. 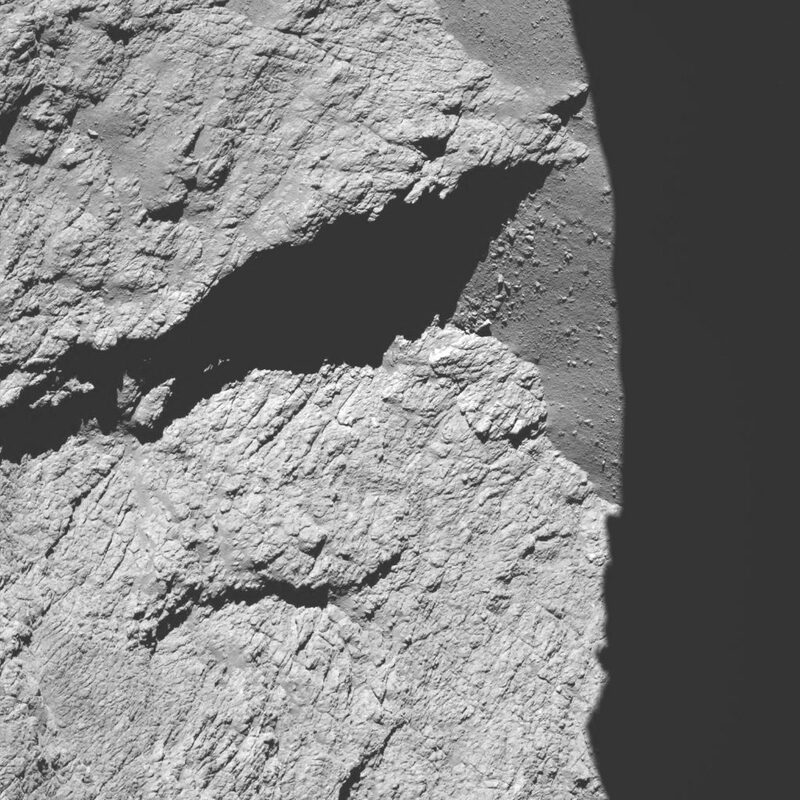 Another striking image from Rosetta's descent onto the surface of Comet 67P/Churyumov-Gerasimenko, taken with the OSIRIS narrow-angle camera at 08:21 GMT from an altitude of about 5.7 km. 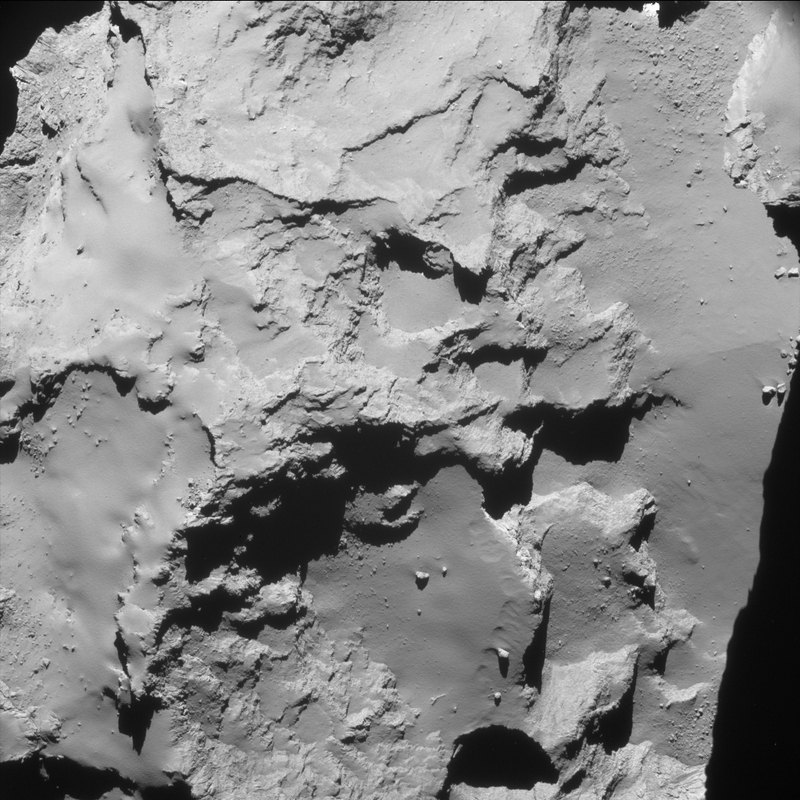 This is Rosetta's last image of Comet 67P/Churyumov-Gerasimenko, taken shortly before impact, an estimated 20 m above the surface. 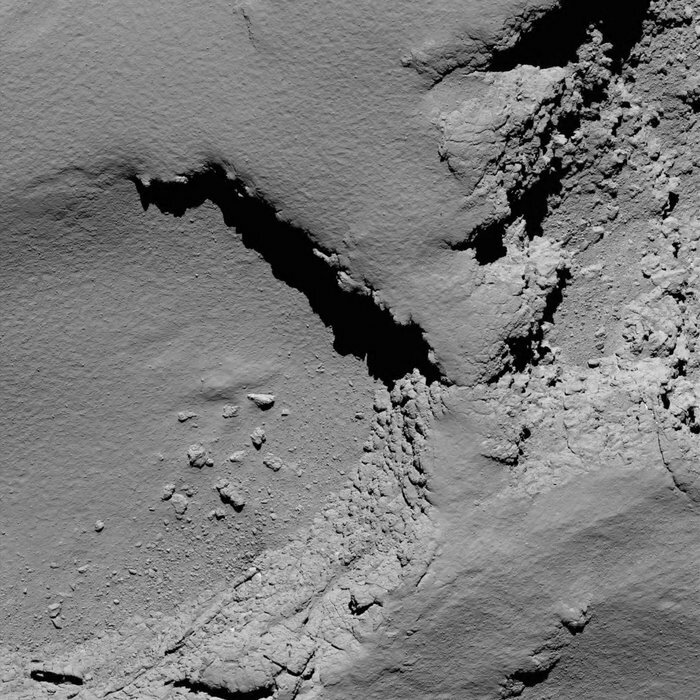 The initially reported 51 m was based on the predicted impact time. Now that this has been confirmed, and following additional information and timeline reconstruction, the estimated distance is now thought to be around 20 metres; analysis is ongoing.